All companies have a legal requirement to keep certain business records for a specific period of time before they can be destroyed. Some of these important documents include personnel records, which must be kept for seven years after employment has ended; invoices, which must be kept for six years; accident books, which must be kept for three years after the last entry; customer correspondence, which is usually kept for three years; and minutes from board or committee meetings, which are normally kept for the lifespan of the organisation. All of this essential documentation can end up taking up lots of office space – space that could be better utilised by your company. Fox Removal & Storage offers an archive storage solution to suit your business needs. 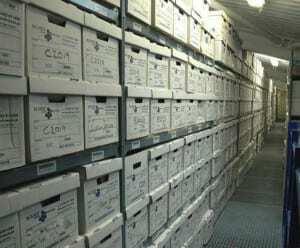 Our document management archives are located at our facilities in Bristol, Cardiff, Cwmbran, Newport, Southampton and Stourbridge. Fox Removals & Storage knows that your documents are a vital element of your business and, as such, all of our facilities provide a 100% secure solution, fitted with intruder and fire alarms and 24-hour CCTV surveillance systems. In addition, our storage facilities are set up to protect your assets from the elements, ensuring that your documents will be free from damage caused by wind or rain. If at any point you need to retrieve documents, doing so will be a simple and swift task; as soon as we are made aware of which documents you require, we will locate the storage box they are contained in and deliver the box to you at a time that is convenient to you. For more information about our archive storage services, please contact one of our dedicated team members on 01633 866923 who will be happy to discuss your data storage needs further.